Recently I faced problem of displaying videos properly in Windows Media Player. I think it started after I configured the Windows Media Center. The videos started displaying upside-down i.e. in opposite direction. I faced same problem in Windows Media Center as well as Windows Media Player. I am using latest versions of both. After going through different forums, here is the solution which I found. 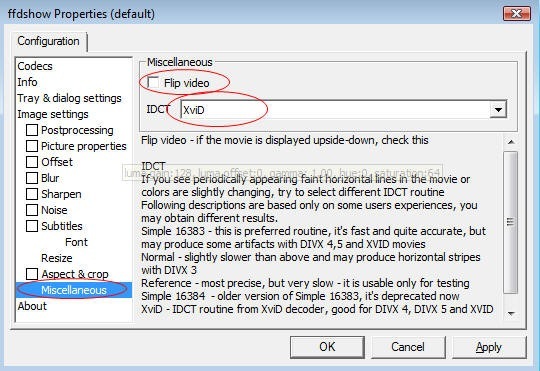 You need to download FFDSHOW filter which is used to configure playback for DivX/XviD. It is just 317 kb download. After downloading and installing the filter, open Start > ffdshow > Configuration, go to Miscellaneous, check / uncheck option – Flip video. In IDCT drop-down, select XviD. Click Apply . OK. Now try playing video file over media Player. If you still face the problem, again go to the options and change the Flip video option. It will solve the problem. The problem mentioned above was known bug in Windows Media Player 10 but there is no info available for same problem in WMP 11 over Microsoft website.